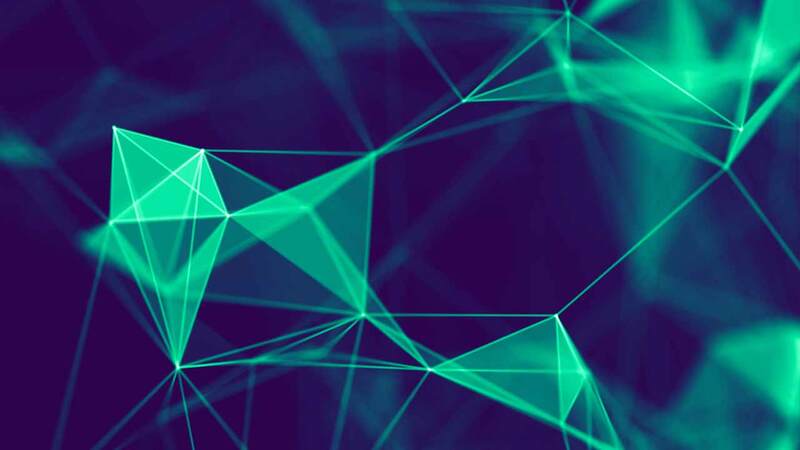 The power electronics industry has reached the theoretical limits of silicon and now is moving to other semiconductor materials whose performance meets the requirements of today’s high power density systems. A number of techniques are being used to overcome the thermal limitations of power modules. One approach is using semiconductor materials which are able to bypass Si’s inherent limitations with regard to heat, voltage and switching speed. These so-called wide-bandgap (WBG) materials, in particular silicon carbide (SiC) and gallium nitride (GaN), have higher breakdown voltages and perform more efficiently at high temperatures. The electronic bandgap is what allows semiconductor devices to switch currents on and off. In WBG materials the bandgap energy exceeds approximately two electronvolts (eV), allowing them to exhibit characteristics and processes that make them superior to silicon-based components for many applications. Typical semiconductors like silicon have a bandgap in the range of 1 – 1.5 eV. The wider bandgap is particularly important for allowing WBG devices to operate at much higher temperatures. SiC, for instance, exhibits much higher thermal conductivity than silicon, with temperature having little influence on its switching performance and thermal characteristics such as on-resistance. Use of SiC devices can reduce power loss as well when applied to power conversion systems; it also reduces on-resistance substantially compared with existing Si devices. SiC has an internal resistance that is 100 times lower than silicon and a breakdown electric field of 2.8 MV/cm, which is far higher than silicon’s 0.3 MV/cm, meaning that SiC components can handle the same level of current in smaller packages. 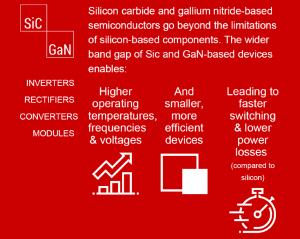 Gallium nitride (GaN), another high electron mobility semiconductor, possesses high breakdown voltage and low conduction resistance characteristics, thereby also enabling high-speed switching and miniaturization. Applications range from onboard battery charging, high-voltage DC-DC and AC-DC conversion, UPS, air-conditioning and appliances. Generally speaking, SiC power semiconductor devices are being specified for applications with high power capacity (in excess of 600V) and GaN for applications involving medium to low-power capacities (<600 V). While WBG devices promise higher operating temperatures and greater efficiencies, there are thermal management concerns that engineers need to consider when designing these devices into a system. High temperature limits mean that, at least in theory, simpler cooling systems will be required. But consider that bringing SiC or GaN components into the design changes the whole system. If you just replace a silicon MOSFET with a GaN device, you will see a measurable change in system performance in an already given design. However, if you want to use all of the performance advantages including the very high switching speed the device offers, you will face challenges that require a redesign of the power module to take full advantage of these newer devices. In the absence of cooling the junction temperature of the semiconductor device would rise at a constant rate to its maximum value after which the device then fails. But the challenge is more than maintaining the junction temperature below the maximum allowable limit by dissipating the heat flux from the power semiconductor device. Cooling requires not just device (chip, package) level considerations but also a system-level outlook. Why? Because performance and reliability are detrimentally impacted by heat generation; increasing the temperature of the system as a whole can lead to device failures, switching losses, and other issues for those components that are not built to withstand high-temperature operation. For example the PCB becomes more than a conduit for electrical connection, but an element for thermal management as well, involving heat spreading and dissipation. The amount of copper on the surface, the copper thickness in the inner layers and the entire geometry of the layout must be taken into consideration. 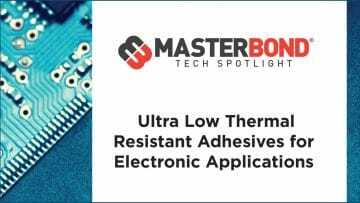 The thermal properties of the substrate also are very important for effective heat dissipation, as the majority of heat generated in the active area dissipates through the substrate. For GaN components substrate selection is crucial as GaN devices are usually grown on substrates such as silicon, silicon carbide, and sapphire, If the GaN-based power devices are created with GaN bonded over an SiC or silicon substrate (which happens because of the prohibitive cost of using a GaN substrate), the mismatched substrate could actually lower GaN’s high thermal conductivity to something less than the thermal conductivity of silicon. As always the key factors influencing thermal design are chip size, power dissipation, material layer properties, junction temperature and ambient temperature. Power semiconductor manufacturers have reduced chip size and the thermal contact areas over the years, which in turn has squeezed thermal designers like so many mangos in a juicer. Higher heat loads and the desire for smaller packaging mean traditional air cooling techniques may not accommodate the thermal management needs of the power electronics module. One approach, used to cool IGBT power modules and high-powered semiconductors, comes from Advanced Thermal Solutions (ATS). 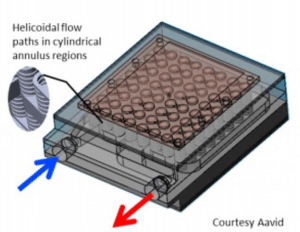 Their cold plate transfers heat from the device to a liquid that flows to a remote heat exchanger and dissipates into either the ambient or to another liquid in a secondary cooling system. ATS employs an internal, mini-channel fin structure to enhance the surface area to maximize heat transfer with low pressure drop characteristics and provides a uniform cold plate surface temperature. Another player in this arena, Aavid for its part offers its Vortex Liquid Cold Plate in a double- sided cooling version. This design is well-suited for cooling a stack of press pack IGBT’s, thyristors or diodes in series. Cooling is provided by a water-glycol coolant with 50% glycol by volume flowing at 11 liters per minute (LPM) at a temperature of 80 oC at the cold plate inlet. In simple terms, an inverter is an electrical device that converts electricity derived from a DC source to AC. In an electric vehicle this induced AC provides power for an AC load—for example, the EV’s electric traction motor. Inverter and converter systems consist of several components including power devices. Hence, thermal management is required at both the chip and system level. WBG devices have allowed automotive suppliers to achieve major reductions in inverter size and mass for greater efficiency. But while SiC inverter control strategies are mainly aiming at high efficiency, development of double-sided cooling technology is aimed at of dealing with higher temperature. Hitachi Automotive Systems, for example, has developed a double-sided cooling approach that uses liquid cooling of the high-voltage power module. The direct double-sided cooling structure greatly improves the thermal conductance, enabling higher current loading and power density. Hitachi ‘s third-generation models use modules with double-sided direct cooling and feature a power density of 35 kW/L, 5.6 times that of first-generation versions. These double-sided cooling power modules operate at higher junction temperatures (Tj,max: 175oC –200oC). SiC and GaN-based power electronics offer the thermal management engineer choices. He or she can reduce the semiconductor temperature, or allow increased power handling for the same temperature rise. 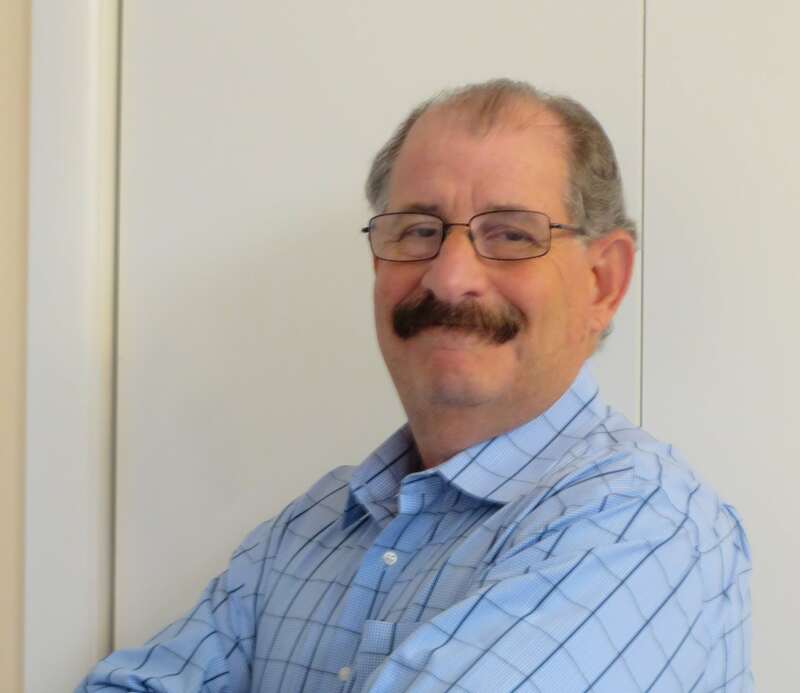 Or they can keep their existing thermal design and run the module cooler, which will have the benefit of prolonging the lifetime of the product. With cooler junction temperature when SiC and GaN devices are used at reduced switching rates, lower switching losses will result and the designer can then decide whether or not to downsize their thermal design to save size, weight, and/or cost. It is important to note, however, that thermal packaging options such as thermal interface materials (TIM) and liquid cooling have to be made with the knowledge that additional cooling efforts could offset some of the size and weight advantages derived from the smaller components. Either way, it is clear that thermal management is essential to achieving the promise of electronic devices using wide bandgap materials. And that cooling techniques are keeping pace with power dissipation levels and the size-down, density-up tendencies of power electronics.